Windows Update has been around a long time. Its mission on Windows 7 hasn't changed much from Vista and XP. Yet, despite this, it has a lot of problems, as we shall see. Last time, I wrote about the latest Windows Update flaw to get a lot of attention, its running for hours, and suggested fixes from both Ed Bott and Woody Leonhard. It's a problem that others have written about too. Shortly after writing the previous blog, I had an opportunity to test these fixes to Windows Update on a Windows 7 SP1 system that was years behind on patches. Bott and Leonhard each suggest two patches that should be installed prior to letting Windows Update check for missing bug fixes. I installed all four of them, in time sequence. That is, I first installed the October 2015 fix (KB3083710) that Bott suggested, then his November 2015 fix (KB3102810). Each required a system restart. Next, I installed the March 2016 bug fix (KB3138612) from Woody Leonhard and rebooted again. Finally, I installed Woody's suggested April 2016 bug fix (KB3145739) and rebooted yet again. I am glad to report that the four fixes worked, Windows Update ran at a normal, reasonable speed. The first check for updates took just under 20 minutes to find 181 missing patches. So, this blog was going to be a short and sweet thank-you to Ed Bott and Woody Leonhard for their time saving tips. But, as I worked though the missing bug fixes, I ran into a host of other problems with Windows Update. The first quirk showed up in the initial list of missing patches. Among the 181 fixes was Windows 7 Service Pack 1. Say what? SP1 was already installed. Service Pack 1 was released back in February 2011 and the patch calling itself SP1, KB976932, was dated February 12, 2015. After some online searching, I dug up a Microsoft page, Description of Software Update Services and Windows Server Update Services changes in content for 2015, describing their 2015 bug fixes. In the February 12, 2015 section it says this about KB976932: "Metadata has changed. Binaries have not changed. This update does not have to be reinstalled." Well, that explains that. The 181 missing patches illustrated another issue with Windows Update. It was about to install both a cumulative update to Internet Explorer version 8 (I said the system was old) and Internet Explorer 11. Why update version 8, if you are going to install version 11? Then too, there is a problem that has been so long-standing, that it is considered a feature rather than bug: Windows Update often fails to do the whole job. That is, it installs some of the missing bug fixes, but not all of them. The Defensive Computing thing to do, is to run it, reboot and run it again until it finds nothing new to install. I did so, and the second check for missing fixes took 15 minutes to find 15 patches. This list of 15 bug fixes, illustrated yet another issue with Windows Update: it installs old buggy software. Just after installing Internet Explorer version 11, Windows Update needed to patch it. Why not install the patched version the first time around? That's not the way Microsoft does things. Never has been. I recall first seeing this with Internet Explorer version 7. On a fully patched system running IE6, I installed IE7, rebooted and ran Windows Update. Back then, I was shocked that there were missing fixes to the just-installed browser. I'm not shocked any more. This too, is a feature, not a bug. Windows Update experienced an "unknown error"
As I proceeded to install different rounds of bug fixes, I ran into another problem: an unknown error. Unknown errors are, frankly, impossible. For an error to be truly unknown, the OS or the application would have to terminate in such a way that the application never got a chance to process any error information. If Windows Update can say that it had an unknown error, then it didn't. And, the example above shows a Code 643 error, so something is obviously known about the error. I have experienced more than my fair share of "unknown errors" from Windows Update. There is typically a link for more information about the error, but that's a scam. Not once has it provided any additional information, which is disappointing, considering that there is a ton of information available. Windows update creates a log file in plain text. I have opened it for other supposedly unknown errors and found oodles of log messages. Nothing was unknown. Windows Update errors are often transient. Besides, we have to continue running it until there are no more fixes to install. My final check for bug fixes took four minutes to find four more patches. This check too, raised an issue. Two of the four patches were unchecked, meaning they would not be installed. Why does Windows Update detect missing patches but then not want to install them? Beats me, and it goes without saying, that Microsoft doesn't explain this. When Windows Update was finally all done, I ran my favorite defrag program (Defraggler from Piriform) to check up on the file system. Windows Update often leaves behind a bunch of .NET files in desperate need of a defrag. The file system had been defragged not long before installing the missing bug fixes, afterwards however, it was a mess. As you can see in the screen shot above, there were two dump files, each roughly 2.7 gigabytes, in more than 42,400 fragments. Considering that the C disk partition had roughly 417GB of freespace, this seems like an awful lot of fragmentation. And, as usual, the C:\Windows\Temp folder had a lot of leftover .NET Framework files, roughly 346MB worth. My experience has been that they can be deleted. had 35 sub-folders, each representing a crash of some type. In all, the ReportQueue folder was 3.2 gigabytes. Clearly, the system experienced lots of problems while installing the bug fixes. When most people denigrate Windows Update, it is for the way Microsoft abuses it to install Windows 10. Clearly, in the trenches, there are quite a few other problems as well. Microsoft can blame the decline in PC sales on Apple, Google, smartphones and tablets all it wants to. It should, however, look in a mirror. Update: May 10, 2016. 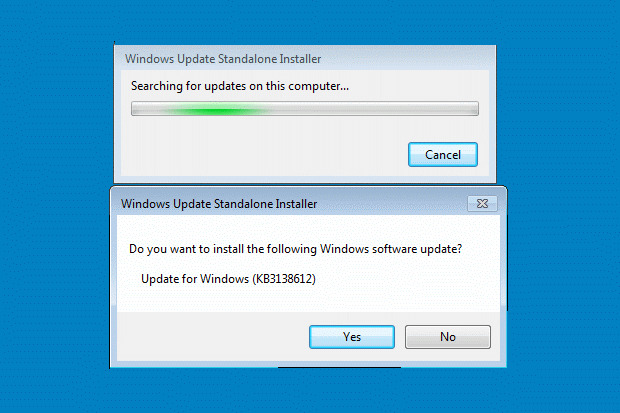 To be clear, individual Windows 7 patches can be downloaded and installed without the involvement of Windows Update. Each of the four suggested fixes in this article are links, and the patches can be downloaded from these links. If a patch is already installed, you will see a message like: Update for Windows (KBxxxxxx) is already installed on this computer. Update: May 15, 2016. For more on this, see my next blog Windows Update on Windows 7 is still a problem.